The Reverend Edward L. Jenkins, Sr.
Rev. Edward L. Jenkins, Sr.
Rev. Jenkins originates from the Island of Jamaica. He was born in the parish of St Ann. He accepted the Lord Jesus Christ as his personal Savior in November 1975 at an evangelistic service at Boulevard Baptist Church in the capital city of Kingston. His received his formative teaching in God’s word way before that time and had the fear of the lord instilled in him by his grandmother Elizabeth. In August 1978 he felt a call to the Christian ministry and subsequently applied to, the United Theological College of the West Indies to be trained as a minister of the Jamaica Baptist Union. Upon graduation, he received a Bachelor of Arts degree in Theology and was commissioned as a pastor in the Bethany Circuit of Baptist Churches in 1985. Two years later in 1987, he was ordained to the Christian ministry at Boulevard Baptist Church in Kingston. He served a total of four years in the Jamaica Baptist Union before migrating to the United States of America in 1989. 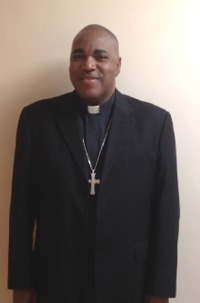 It was not long before he joined the Presbyterian Church of St Albans, Queens pastored by Rev Dr Edward Davis, and became Youth Coordinator for that church. He worked there for four years. In late 1994 while serving as Youth Coordinator of the Presbyterian Church of St Albans, he received a call to be the pastor of the Ebenezer Wesleyan Methodist Church in Brooklyn, New York. He accepted that call, and was installed as its 11th pastor in March 1995. He has served there now for 19 years. Edward loves the Lord and loves people. He is passionate about ministry and about the power of the Word of God to change lives. In May 2013, Edward graduated from Northeastern Seminary in Rochester New York, with a Master of Divinity degree in Theology. The time spent in this institution, has changed for better his view on, as well as his commitment to ministering to all of God’s people. He continued to pastor the Ebenezer Wesleyan Methodist church, while at the same time making those long, weekly treks to Rochester for four years (2008 -2012). Rev Edward Jenkins is married to Angella and they are the proud parents of three children – Renee, Rochelle, and Edward L Jenkins, Jnr.